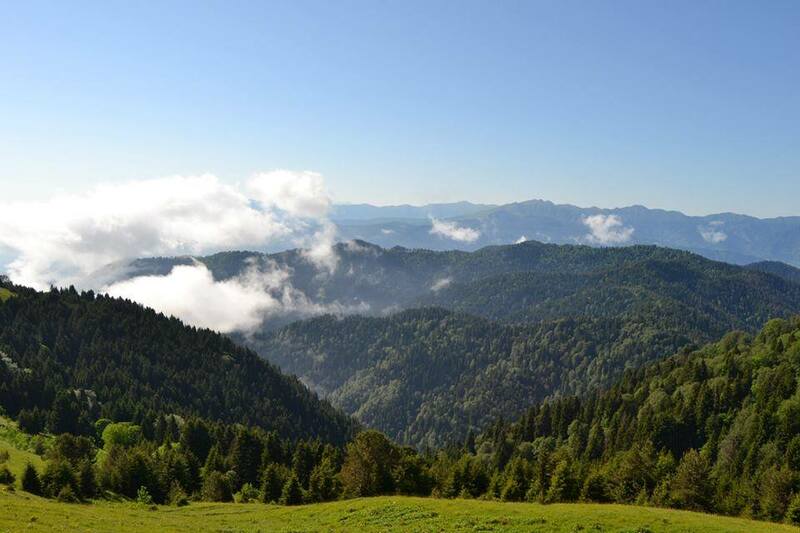 Borjom-Kharagauli national park stretches across Samtskhe-Javakheti and Imereti regions of Georgia, covering more than 1% of the countries territory and more then 85 000 hectares of the most attractive pristine forest land the park is one of the largest in Europe. The huge area of mountainous forest has been preserved here in its pristine and untouched state. 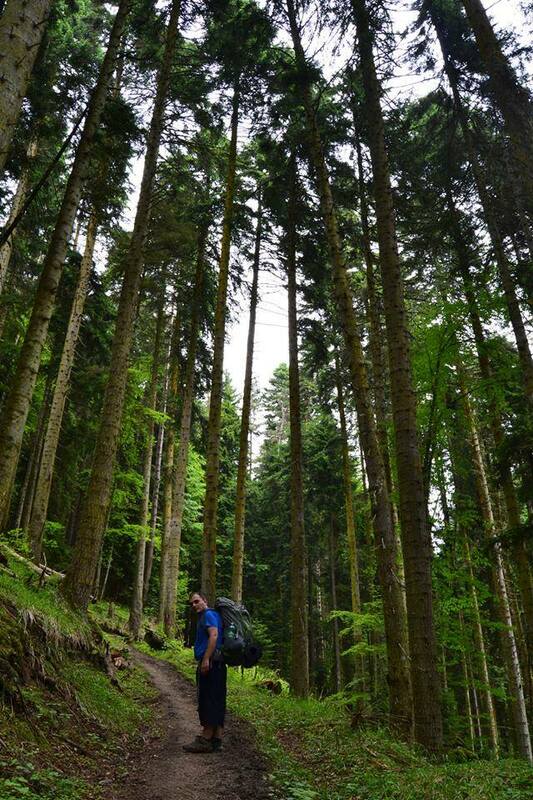 A number of endemic and relict species of flora and endangered species of fauna can be found in the forests as well as among sprawling sub alpine and alpine meadows of the Borjomi-Kharagauli National Park. The highest peak Sametskhvario is at the altitude of 2642m. 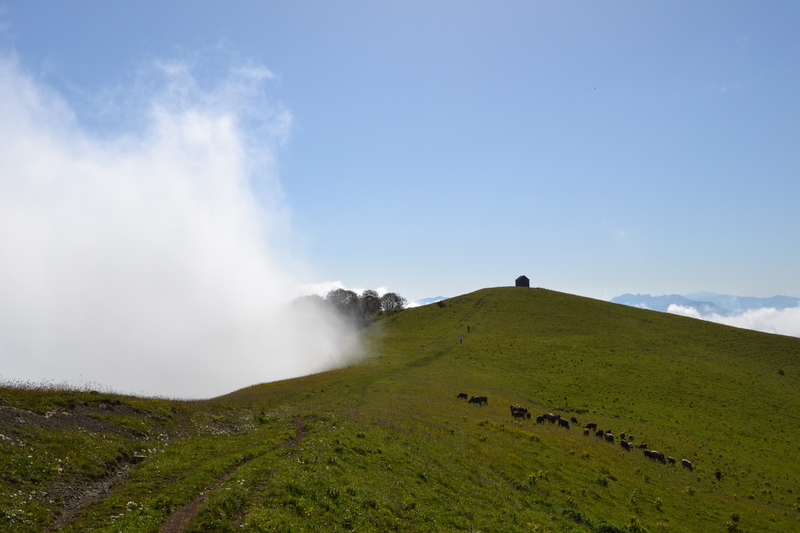 Park offers 9 trials, among those this post is dedicated to short version of Trial 1, to the Lomis Mta tourist shelter and mountain on the ridge of Meskheti with views to Greater Caucasus Mountain range. It’s the most popular trial along with Atskuri-Marelisi trial’s short version called ,,panoramic route”. This route is marked like most of the routes of the National Park. Difficulty is average. Overnight accommodation is available in Lomis Mta shelter at the height of 1780m. There is water source nearby the shelter. There are some some beds with no mattresses which you should reserve in advance while you register. Visitors are reminded to bring food, sleeping bags and dishware to the shelter. There is wood-burning stove in the shelter which makes it possible for extreme hikers to get up in the snow-covered mountain in cold winter day and sleep at the shelter. 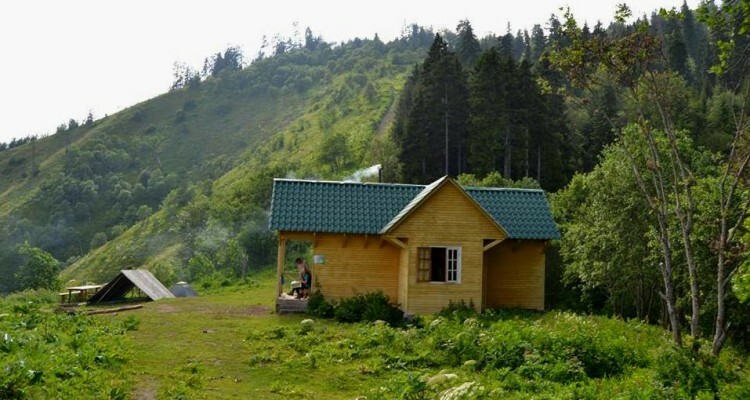 There is also camping places nearby if you prefer to pay for camping site only. You can rent a horse to get to the shelter. Renting horses is cheaper in Georgia as compared to Europe, 60 GEL per day means that it will be less than 50 EUR for 2 days for horse + guide. You don’t have to worry about not being an experienced rider. It takes 6 hours to reach the shelter by horse where you can stay and come back by the same route (!) not though Kvabiskhevi which is too steep descent for horse. The whole first Trial is long: 39-41km and takes 3 days to finish, but the short version (Lomis mta route) takes only 2 days. The route is around 11-12 km one way, vertical 1150m; but the second day early morning you should walk up to the Lomis Mta peak (2187m) from the tourist shelter. 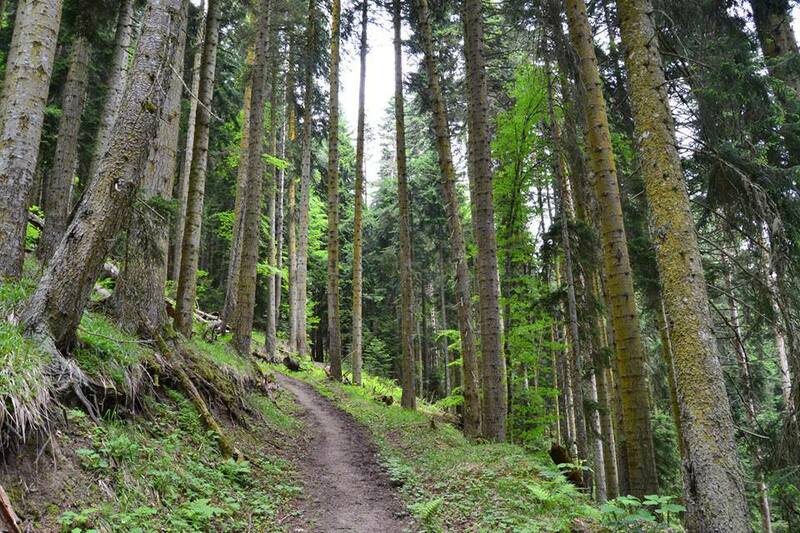 It adds extra 3-4km and 400m vertical. Going up the peak is absolute must if weather is nice. 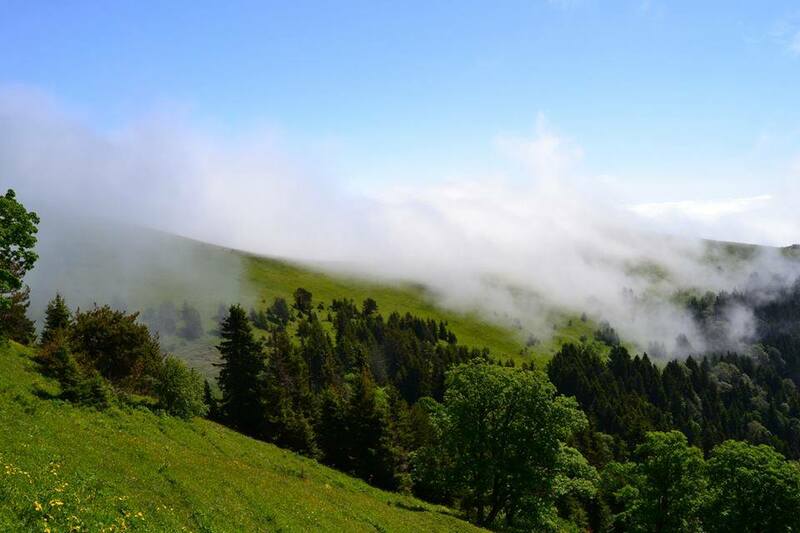 In some days you will see the peaks of Great Caucasus range, including views to Elbrus summit, beautiful landscapes of Imereti and Javakheti regions, in some cases you may see the sea of clouds if it’s rainy weather on Imereti side. St. Giorgi church is located on Lomismta. In addition to beautiful views, there are flourishing rhododendrons in May and June. The second day you can turn down Trail 6 (if you prefer- it’s steep but not dangerous path at some point of trial 6) to come out on the Akhaltsikhe road at Qvabiskhevi. In this case you make sure not to miss the turning (next to a large park map) where Trail 1 heads off left uphill from the vehicle track. By the way if you have only one day it’s possible to do a day trip combining 1st and 6th trials, but in this case you will miss the possibility to stay at the tourist shelter, beautiful views and alpine valleys. Till you reach the shelter you will walk through very beautiful pine forest which I am sure you will enjoy it especially if it’s spring (late May-Early July) or Autumn season (till the second half of October). Generally this route is open from May to November but you can check conditions of snow at the visitors center. How to get there: You need to drive 160km to Borjomi’s visitor’s center (1km from the center) or take Borjomi or Akhaltsikhe bus from Didube Station (8GEL). You need to get to the visitor’s center for registration, maps, permits, explanations on the route, etc. Also if you want to rent a horse (50GEL/day), tent (10gel/night), sleeping bag (5GEl/night), etc. Then you need to drive to Likani at the checkpoint of National park or rent taxi for 5 GEL. If I rent a horse, can I get to Lomis Mta peak by horse to enjoy the view? Can it be done in one day? And is it possible to have a guide come along? Is it a problem not being an experienced horse rider? This sounds like a wonderful Park! If you rent a horse, it comes with guide so you don’t have to worry about not being an experienced horse rider. You can make it to the top and enjoy the view. Hope you come in a period when it’s green and when it’s great visibility. Unfortunately and fortunately, it can not be done in 1 day. You need 6 hours by horse as it’s full ascent. You will stay in this beautiful cottage or camp nearby. If you don’t have any kind of necessary camping gear you can rent at the National Park Office. Visibility is the best in the early morning so you should go up to the top in the morning. National Park’s service cost for the horse+guide is 60GEL a day which is less than 25EUR. Wish you a pleasant trip!